In honor of my twenty-third year of being on this planet yesterday, July the 17th, I decided to incorporate my favorite color into Katrina and I’s breakfast. Now blue isn’t a color often seen during breakfast unless your eating some sugary kids’ cereal or a pop tart or something. You don’t usually see blue scrambled eggs. I had no idea if this was even going to work, but I did it anyway cause it was my birthday gosh darnit! So I scrambled up four eggs and added a ton of blue food coloring. We had the dyes left over from making frosting for a cake last week so I figured I might as well use it cause there was a ton left. Now the sight of the blue eggs wasn’t that strange for me but according to Katrina it did make her gag a little at first. I had no problem with them until I went to add the cheese. This week when went shopping we got the neon orange American singles slices. When you add orange to blue you usually get a brownish color but then with the milk I added brown turned gray and that’s what got me to gag a little cause it started to look like I was frying up some fresh brains. The cheese eventually cooked down into the eggs and it miraculously turned back to bright blue. I don’t know how that works, but I’m glad it did. For anyone wondering the eggs tasted fine. If anything they tasted better than normal eggs cause they were blue. 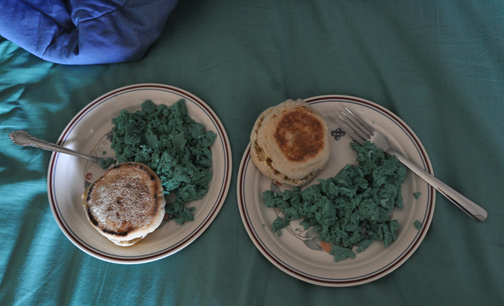 Anyway we brought our blue breakfast back up to our room to eat in bed only to find that our eggs matched the sheets almost perfectly. It was an awesome start to my birthday indeed! Posted on Sunday, July 18th, 2010 at 11:34 am	in the category:Check This Out!, Events/ Shows, Food, Holiday, Illustration. Comment RSS 2.0 feed. Comment it , or trackback this post.